Mipham Otsal, Director, Ladakh Theatre Organisation, Leh: Culture having the 10 streams of knowledge traditionally known as ‘Rig-nas Chu’ or ‘Rigpai-gnas-bChu’ is a well-defined culture. The 10 streams of knowledge do exist in some places. The presence of 10 streams of knowledge in Ladakh makes it a culturally diverse society. Today, when we proudly call ourselves as Ladakhi’s it is all because of our ancestors who made a tremendous contribution towards society. Theatre ‘lzos-gar’ is included in 10 streams of knowledge and is categorized into classical, contemporary and folk traditional. It contributes largely in an individual’s life by improving rational thinking, language and many other aspects. Also, it helps in spreading awareness among the people. Theatre remained neglected and to preserve it Ladakh Theater Organisation was established. From the primitive period the theatrical aspects were carried, and it has also transformed people. In few countries and metro cities of India, theater in education is a compulsory subject. It develops their body speech, mind and imagination. So when a child is developed in all the aspect they are successful in all fields. In Ladakh, people have less knowledge which is why theatre is ignored. With change and development, people are failing to keep the culture intact. People became more individualistic and materialistic that they hardly contribute to the welfare of society voluntarily. It is necessary to have change but along with it the cultural preservation and promotion is a must. Ironically, the development and cultural identity does not go hand in hand in Ladakh. People should change with time but not at the cost of one’s identity. Cultural extinct should not be the case rather cultural integration should be there. For example, one can make a good presentation and add more ingredients to change the taste of ‘Paba’ traditional food. Cultural assimilation could happen if we fail to maintain our own cultural and ethnic identity. The responsibility is not on the shoulder of one individual or a cultural organization but every Ladakhi has a greater role to play in conserving its culture and language. Even though we focus Bhoti language to be included in the 8th schedule of the Indian Constitution, but people of Ladakh are not interested in preserving and promoting the language. Prior to demanding it, we should first bring improvement in ourselves. The culture and identity are on the verge of extinction and people seem not to be scared and serious about losing it. It becomes very important to pass down one’s heritage to the younger generation. • Hill Council should make people aware of all the consequences. There is a need for discussion on how to protect our identity and culture. • We Ladakhi should stop copying the western culture instead we should work on developing our own tradition. • School should teach the student about the Ladakhi culture. Instead of teaching guitar and jazz, focus is needed on our own traditional instrument and music. Dr. Thupstan Norbu, Assistant Editor, J&K Culture Academy, Leh: Ladakh is known for its rich and unique culture which is manifested in our ideals, ideas, beliefs, values, folklore, folk songs and environment. It also manifests in the aesthetic quality and humanistic dimension of literature, music, drama, architecture, carvings, paintings and other artistic forms. The culture of Ladakh is the distinctive way our people respond to, reflect upon and express their experiences of life. It emanates from our history and is reflected in our social values, family structure, belief systems, sense of social obligation, attitudes to work, the forms and manner of our artistic expressions, the food we eat, the clothes we wear; in short our behavioural patterns that historically mirror our responses to life. Traditionally, Ladakh’s culture can be broadly represented by certain well-defined streams of knowledge traditionally known as ‘Rig-nas Chu’ or ‘Rigpai-gnas-bChu’. These ten branches of knowledge are classified into two known as five major and five minor knowledge systems. The five major streams of knowledge traditionally called as ‘RignasChewaLnga’ are: ‘sDa-rigpa’ (science of grammar), ‘Tsadma-rigpa’, (Science of logic), ‘Nangton-rigpa’( science of spiritualism), ‘ bZo-rigpa’( Science of Art) and ‘Sowa-rigpa’( science of herbal medicine). The five minor streams of knowledge (RignasChungwaLgna) are ‘Snyan-ngag’( Poetry), ‘ lzos-gar’( Play), ‘ngon-jod’( vocabulary/synonyms), ‘rTsis’( Astrology) and ‘sDeb-jor’( style of writing). In fact, these ten sciences of knowledge are the blessed gifts of Nalanda tradition to the Himalayan Kingdom. It is said that all the objects of knowledge are included in the five major sciences; therefore, study of these streams of knowledge was indispensible for the overall development of a society. All the sciences of knowledge except ‘Adyatmavidya’ or the science of spiritualism (which refers to Buddhism) are secular in nature and hence can be studied by all irrespective of any religion. Ladakh is rich in fine arts and paintings sculpture, wood carving and many more. Ladakhi language is recognized in the state. The books were published since 1976 and till now we have over 400 journals and academy has been publishing books and journals since then. One of which is Sheeraz which is available in the entire state in all recognized language. The Journal is an indigenous development. Theatre is one among the five minor sciences of knowledge. The earliest form of theatre was Sanskrit Dramas. In Tibet, Drubchen Thangthong Gyalpo introduced Tibetan opera or ache lhamo in the 14th Century. The structure promoted by this great saint of Tibet gained considerable momentum in the neighboring countries of Tibet which include Ladakh. As many people of these regions have formed theatre groups like Ache Lhamo and Manepa in subsequent years. They usually dealt with historical events and lives of Buddhas and bodhisattvas. Initially, they performed by travelling and later became popular under the name Manepa. People considered Manepa performance as a way of appeasing misfortunes besides serving as entertainment. 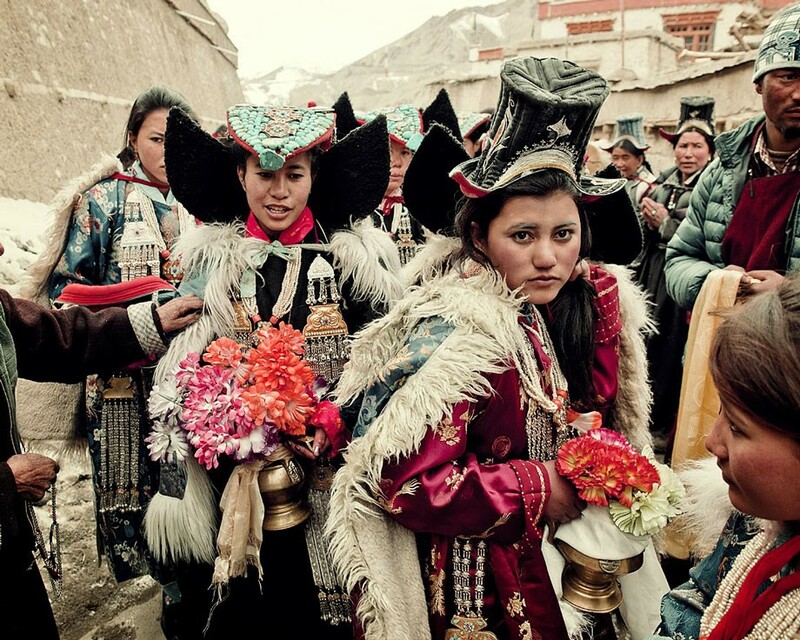 This tradition even lasted in Ladakh until the 1960s. Later certain repertoires based on Jataka tales etc. were staged on local platforms. Before 1977, it is said there was no playwright in Ladakh whose play could be staged except Namther of Dowa Zangmo etc. by giving it a theatrical shape. But today we have few playwrights and theatre graduates who have been putting their continuous effort in preserving this knowledge system too. With the opening of Leh branch of J&K Cultural Academy, efforts have also been made to preserve and promote theatre in Ladakh by organising theatre workshops and District Drama Festivals. If we see the current scenario, Ladakh has opened to tourism, the emergence of cultural integration and western cultural influence are highly found that results in cultural heterogeneity. Likewise, the Ladakhi folk song has lost its charm. A few years back we witnessed a drastic change and people have accepted the change without thinking about the side effects and future thoughts. But today it is good to see that people are realizing especially the youths about the importance of culture and tradition. There is still a long way to go. People must give importance to restore our real identity. There is this urgent need where the stakeholders must have proper planning to avoid adverse consequences. Our society is copying the trend of other places, but first, we need to know our own cultural roots than one may learn about other culture. We have a fine example of Tibetan communities who have set an example everywhere in the world in preserving and protecting their culture and language. • Material prosperity is important but should not be the goal. The scholars should impart the importance of culture so it will remain intact generation after generation. • The scholar’s biography should reach the children and let them know about history. • If people give importance to their heritage, then there will be no threat of losing the culture. If people will not give importance, then naturally there is a threat to the culture.